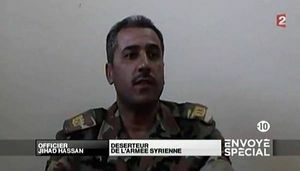 Major Jihad Raslan, (Syrian Air Force, defected, self-described), is an important alleged witness to The Houla massacre. Now serving as a commander in the Free Syrian Army, he of course is one of those swearing to an attack by the government he served, he says, until just after he witnessed the massacre. 3 In Charge on the 26th? On June 2 Raslan’s account was first publicized by the Guardian (the Guardian-affiliated Observer mentioned, but it doesn't appear on that site): "I “saw massacre of children, says defecting Syrian air force officer,” by Martin Chulov. Chulov, who had earlier interviewed star witness Ali Al-Sayed, effused that "the officer's account to the Observer of what took place is among the most important of the testimonies to have emerged since the massacre." The initial interview was picked up by many others as major news (e.g. Al Arabiya and the Atlantic Wire). And finally he spoke to the team from France 2 producing the September, 2012 documentary Houla, autopsie d’un massacre. Here's his name is given differently, as "officer Jihad Hassan." Account details will require some translation before appearing here, but the rest is addressed below. A lot of them were bald and many had beards," he said. "Many wore white sports shoes and army pants. They were shouting: 'Shabiha forever, for your eyes, Assad.' It was very obvious who they were. "We used to be told that armed groups killed people and the Free Syria Army burned down houses," he said. "They lied to us. Now I saw what they did with my own eyes." In Charge on the 26th? 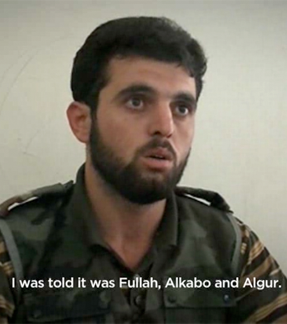 In fact, a man who might well be Raslan was seen in the rebel/defector ranks on the 26th. What's strange is how he seemed rather in-charge, greeting UNSMIS monitors on their arrival at the mosque, around mid-day (see inset stills). Standing in the mosque, the man gives his details (audio not too clear) and shows an ID card, presumablyhis own, but not readable (same template seen on the card of Army defector Hussein Harmoush in 2011. He then sits down with them and seemingly briefs them on the situation as he, and the other rebels controlling the the mosque with the victims, saw it. This man's face, nose, build, hairline, uniform (defector) status, and relaxed, confident, charismatic demeanor, are all immediate matches with the alleged witness later interviews by Der Spiegel. He seems here to have a different hair style and uniform than seen in July, but those were his clear FSA days (leading the 'Bouqu Brigade 72 company,’ since the rebels have no Air Force) . This first day, he looks freshly switched, still with his three stars (suggesting something higher than major, actually) but with a pin with wings on it, suggesting Air Force. Even by pulling rank, it seems strange that a defector just hours into his new life could become positioned as the main point man for the outsiders investigating this (possibly rebel) crime that allegedly triggered his switch. Otherwise, the best guess for a man in the position seen here is someone who had defected some time ago, and was already in a trusted position with the local FSA units by the day of the massacre. In the interest of being clear on the possible match, see the inset comparison above. There are difficulties even adjusting for different lighting and such. The color difference is little problem, and the overall head and facial shape is possibly consistent but, put side-by-side, not at all obvious. The obvious apparent mismatches are in the realm of hair; to be the same man, his hair had to look thicker, but also grayer, hairline lower, and his eyebrows fuller, a month later. A combination of different lighting, some hair treatment, better health, and perhaps makeup on the brows, could make him look this different. Otherwise, this aspect of this alleged witness could be a dead end. The rest is worthy of study either way. They worked against the Sunni majority, as Chulov heard; Sunnis make up the bulk of the lower ranks of the military, he wrote, locked in place by officers of "the Alawite sect, which uses an uncompromising police state to maintain its iron-clad grip on Syrian society." Just as the military reflects the society, so the locked-down Sunni town of Al-Houla reflected both. Raslan explained "there were no Sunni soldiers around Houla itself [when the massacre took place]. They are all Alawites there, the officers and the soldiers. … [Houla] is a very sensitive area. Many of the Shabiha in Syria come from here. They won't defect from here." This claim of an all-Alawite force over Houla seems quite likely exaggerated at the least, considering the normal representative mix of military conscripts used in the Syrian Arab Army. Major Raslan claims to live right on Saad road, just 150-300 meters from one of the homes where the Abdul Razaq clan was massacred (and,implicitly, near all of them). This, and not any involvement in the killings of his ostensible neighbors, is how he got so much direct knowledge of what happened to them. Major Raslan headed the first-ever fact-finding mission into three of these homes, within perhaps two hours of the first attack, and just after the last. Reports suggest the killings here happened anywhere from 4:30-5:00 pm and continued for a while. As Raslan explained in his video interview: "After the Al-Maghrib prayer, at around 7 or 7 :15 pm, the site was clear again and we went in to assess the situation. We went out into the street to see if our neighbors were okay. After running into the shepherd's injured wife and assisting her, he and unspecified other(s) started inspecting homes. "I was the only person who had a flashlight," he added. Sunset that day in Al-Houla would be around 7 :30 pm, so he sounds like someone who was there. In order, they first visited "Samir’s house." Samir Abdul Razaq "was lying in the first room to the left and it smelled of corpses and blood. ... I fisrt saw Samir and then I saw his family and children. They were inside and lay on top of each other. There was a lot of blood. Next they checked "the home of Mustafa Abdul Rassak … It had a veranda on the east side." He was injured but barely alive, "beaten at close range with a sharp object. His head had been partly fragmented. … part of his head was also on the ground. … He could breathe and see, but there was no way to help him. I told him he should recite the declaration of belief." Leaving the veranda, "we entered the house … [and] found the bodies of his family, wives [sic ?] and children in the guestroom. They were stacked on top of each other. ... It looked as though they had broken some things during their attempt to escape. The TV, table, and other things had been knocked over." Finally, they "went to Abu Firas’ Home. He was the only man in the house. He was literally slaughtered. His family and the family of his brother had been murdered and their bodies had been stacked on top of each other in the guest room. They gathered the people in a room and killed them. Strangely, there is yet another alleged head of a targeted Abdulrazaq household there who's also named Abu Firas, sometimes. We can be certain he's supposed to be a different man because he isn't dead, having spoken of his slaughtered family to two UK tabloids, one under the name Abu Firas, the other under the name Hassan. Coincidentally, Major Jihad, whose A.F. Abdulrazaq was killed along with his family, also uses Hassan sometimes to replace Raslan. Whenever an alleged witness gives two or more accounts, comparing them is useful. 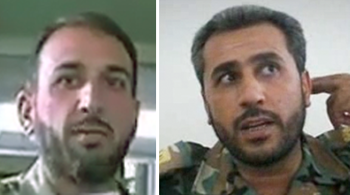 Major Jihad's two comprehensible accounts are reasonably consistent (virtually photographic relative to the shifting details of Ali Al-Sayed), but sometimes consistency is as good a clue as its opposite. Major Raslan's account to Reuter/Der Spiegel makes frequent use of the plural "we," with no explanation who else was with him. At first he only mentions himself in his home. The only person that springs to mind as a companion is fellow Reuter/Spiegel interviewee Malik Baqur, apparently already with the opposition, and involved in the protest of that day. There is however confusion here. In text, Malik was "in his cousin's house on Sadd Street when he heard that armed men were coming down from Fullah to Taldou." He remained inside. "Until six o'clock, there was so much shelling that I was afraid to go outside. At about 5:30 p.m., I saw 40 men in uniforms and civilian clothing going up to Fullah," or departing after the massacre. Perhaps 6:30 was meant. “After I received the message, I walked along Saad Street until I was about 300 meters from the site of the massacre. I reached this spot at about 6:30 and stayed there. I saw about 40 people in civilian clothes and military uniforms who were moving in the direction of Fullah. They were about 150 meters from the homes of the residents. Then I saw a pickup equipped with a 14.5 mm machine gun. The pickup was driving towards Fullah alongside the group. It was colored silver. For ten minutes I watched this group..."
As they walked, the Shabiha "fired into the air, celebrating their victory," by which he meant the massacre. He just stood there watching them, to make sure it was really Foulah they were going to. "I was standing a little higher up and could see the men until they were about 100 meters from the village," the text says. The silver (reflective) pickup would help long-range visibility. Plus, he recognized it, the text part adds: "I had seen it a few days earlier at the checkpoint that had been set up in Fullah sometime earlier." "Then I ran into Raslan, and we went into the houses together and saw the bodies. Some had had their skulls split open as if they'd been hit with a butcher's hatchet, while others had been shot in the head, execution style, with a small hole in the front and bigger hole in the back. I counted 17 bodies all over the place in Mustafa Abdul al-Rassak's house." ↑ 2.0 2.1 2.2 2.3 2.4 2.5 2.6 2.7 2.8 Searching for the Truth Behind the Houla Massacre By Christoph Reuter and Abd al-Kadher Adhun. Der Spiegel English. July 23, 2012. This page was last edited on 1 November 2012, at 18:03.